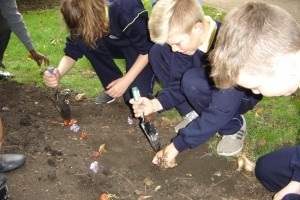 In association with Dundalk Youth Centre and the Youth Arts festival, some members of 6th class met after school in St. Helena’s park for a guerrilla gardening/art workshop. 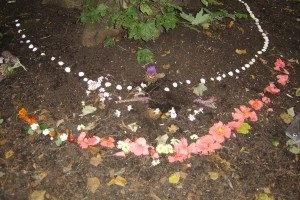 They were shown photos of gardening art and then using foraged natural materials (such as shells, stones, petals, leaves and thistles) they decorated the base of trees in various symmetrical patterns. 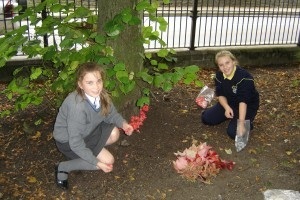 After this, they planted some bulbs and then created seed bombs from a mixture of wildflower seeds, compost and clay. 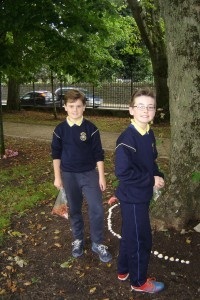 These seed bombs were launched and thrown along the ground where wildflowers will hopefully grow in spring time!